Come See for yourself why clients are raving about our pilates studio. Pilates challenges your core with the end result being a longer, leaner, and more-toned you. And if you keep with it regularly, you'll be showing off a set of sculpted abs. 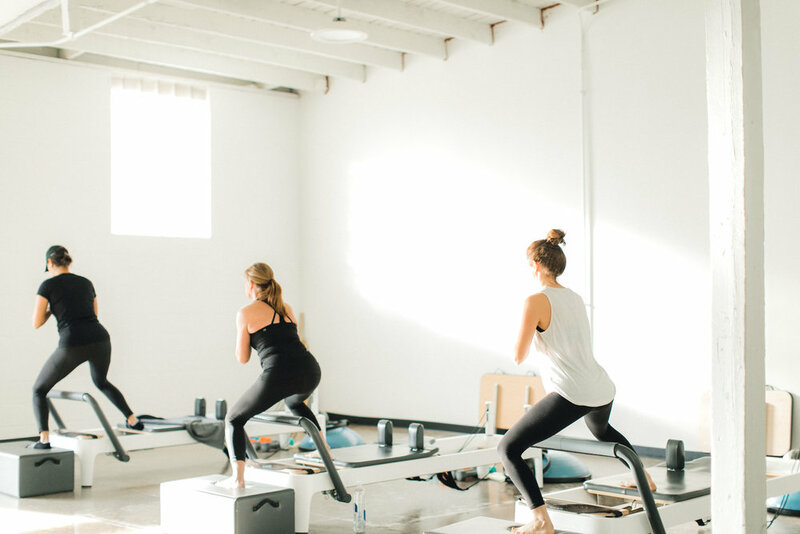 Focused on seamless flow and transition, this high energy Pilates class will have you toning and firming all while you stretch and lengthen the entire body. This workout combines Pilates and Tabata for the most intense burn ever. Stoke your metabolism and carve your core with this unique training mash-up. Nothing out-burns Tabata per minute, and nothing out-firms Pilates for abs. 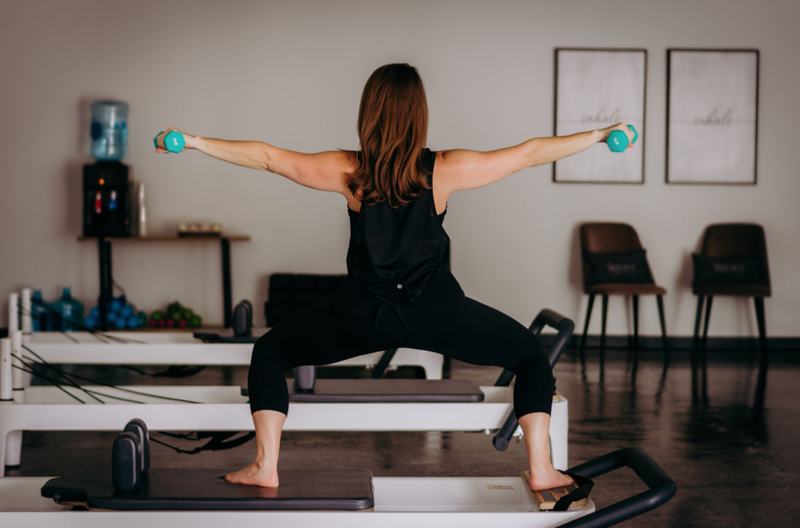 Pilates Power is a powerful fusion of Reformer movements, fat burning cardiovascular exercises, as well as full body strength building with weights. It is a conditioning program that will lengthen and strengthen your muscles, with the added advantage of improving your muscle-to-fat ratio. Pilates Power is fun, quick-paced, and will work your body from head to toe. We promise you will leave drenched in sweat. Come workout along with Amanda. Classes offered at a discounted rate and are not included in unlimited packages. Class is not suitable for beginners or those that require special modifications. Strong Foundation Interval Training is a one-hour, group class that incorporates dynamic conditioning, fast-paced cardio, and a foundation of Pilates principles. Each workout includes a combination of resistance training and compounded exercises using body weight and weighted movements. An S-FIT workout incorporates interval training; alternating bursts of activity at near personal-maximum, followed by periods of active recovery. It’s a total-body workout that will help you burn fat and build long, lean muscle while increasing cardiovascular capacity. This class is as effective as it is energetic! Ready to up the ante? Power Up! will help you not only maximize calorie burn but also help you build strength. Through a mixture of high intensity interval drills and specialized strength training movements you feel the POWER! Get ready to sweat and have some fun! 7 days a week. See Schedule for times. Call 859.230.6059, book online or through the MindBody app. Kindly give us 12 hours notice for cancellations. Cancellations made within 12 hours of class start time will be subject to the full charge or will be taken from package. $15 fee for 'no show' - A ‘no show’ is defined as any reservation that is not canceled and the client does not attend their reservation. We require a minimum of 2 clients in each class. We reserve the right to cancel a class if fewer than 2 clients are booked. Clients will be notified of the cancellation no later than 3 hours before the class start time (early morning classes will be notified the afternoon before). You will be provided with alternate class times and we will work with you to find classes that work best with your schedule. To prevent class cancellations, we encourage you to book your classes at least 24 hours in advance. Amanda was introduced to Pilates in 2011 and has been head over heels in love ever since. She completed her Pilates training through Balanced Body, and has been teaching Pilates since 2014. Her style of teaching is athletic, innovative, fun and challenging. You will get a full body workout, leaving your muscles weak and your clothes sweaty. Amanda focuses on following the fundamental Pilates movement principals while helping her clients sculpt rock hard cores and long, lean and strong muscles—all while improving flexibility and posture. Kathryn began her Pilates journey in 2016 and immediately knew she wanted to become an instructor. She completed her Pilates training through Balanced Body, and has loved teaching ever since. Kathryn's passion is passionate about following Joseph Pilates' Classical Method while incorporating the latest techniques and choreograpy to challenge even her most seasoned client. Her classes are fun and focused - leaving you with a stronger mind, body, and soul. Stacy was introduced to Pilates in 2008, after a car accident. She discovered the Pilates method was a great way to regain strength, coordination, and balance. She knew instantly, that she wanted to help others discover the amazing benefits of Pilates. After many years of rehabilitation, Stacy completed her comprehensive instructor training through Balanced Body in 2014. Stacy firmly believes that if any student, regardless of their age or fitness level, brings the proper dedication, she can lead them through the evolution of a better body. Her student’s goals range from building firmer, stronger bodies, losing weight, increasing flexibility, and gaining proper alignment in their bodies. Stacy’s passion for helping others is what drives her to provide her students with careful attention, encouragement, and compassion. Other Certifications: ACE Group Fitness Instructor and Personal Trainer.